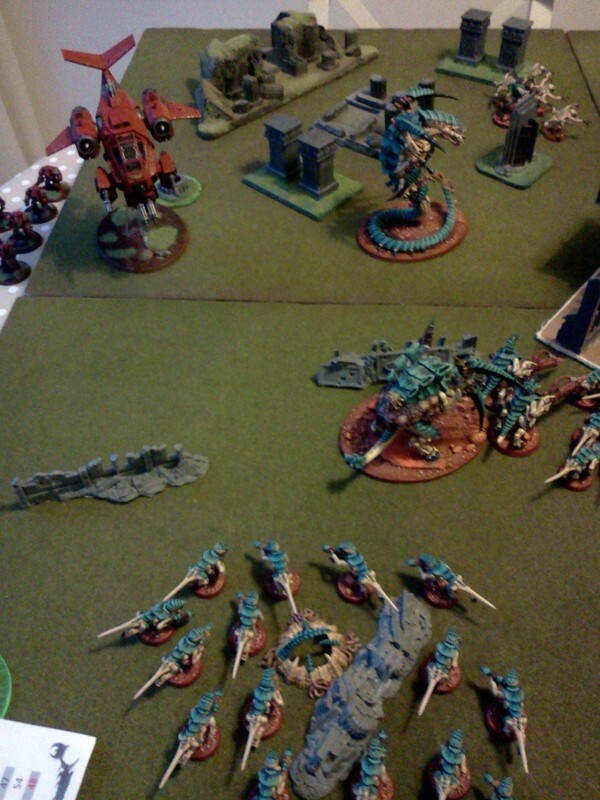 My third 6th Edition game and it was round to PeteB's for our second showdown. 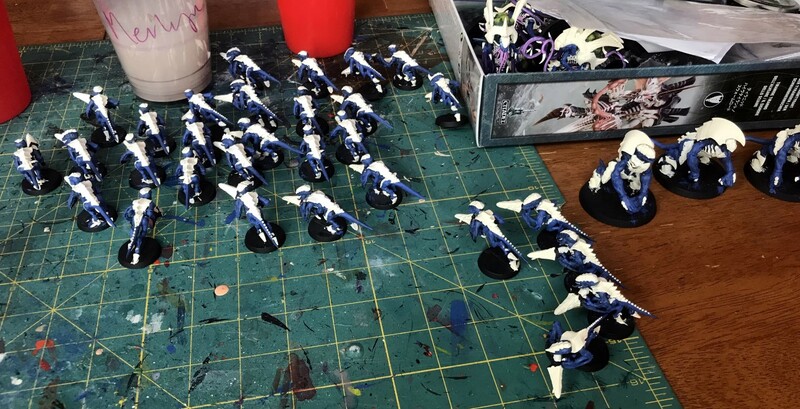 Obviously still a lot to learn for both of us. I've had the advantage of the full rules﻿ but I haven't actually been reading them religiously so it wasn't too much of an advantage. 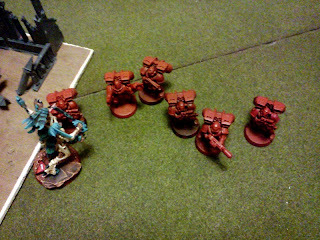 PeteB had a tactical squad split in two, 8 man assault squad, razorback, Stormfinch, terminator squad with Librarian and an aegis defence line with quad gun. 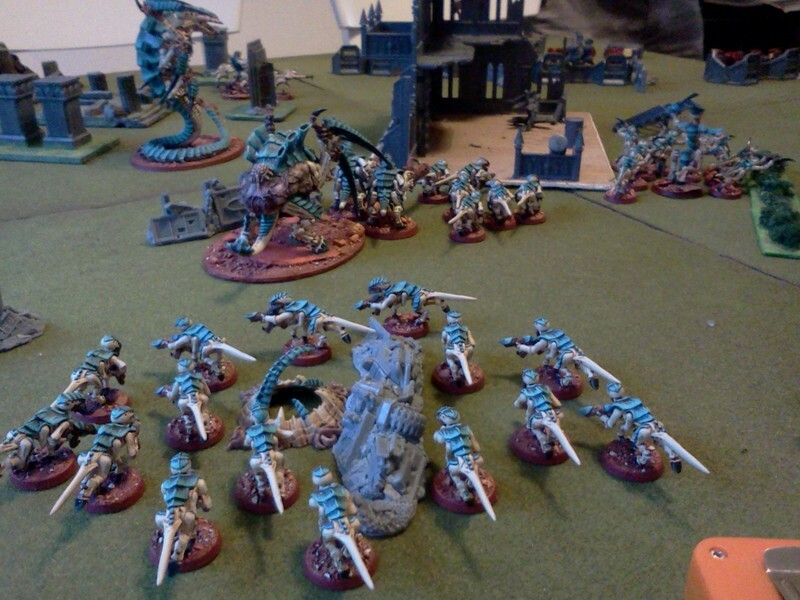 I had the usual suspects Hive Guard, Tervigon, Trygon, Prime, 11 Hormagaunt, 10 Devgaunts, 6 Stealers and Broodlord with Iron Arm and Warp Speed. 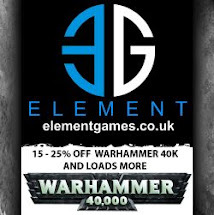 My Warlord [Prime] had the ability to allow an extra Run dice or a reroll for any unit within 12", PeteB had something that meant my Reserve roll had -1. 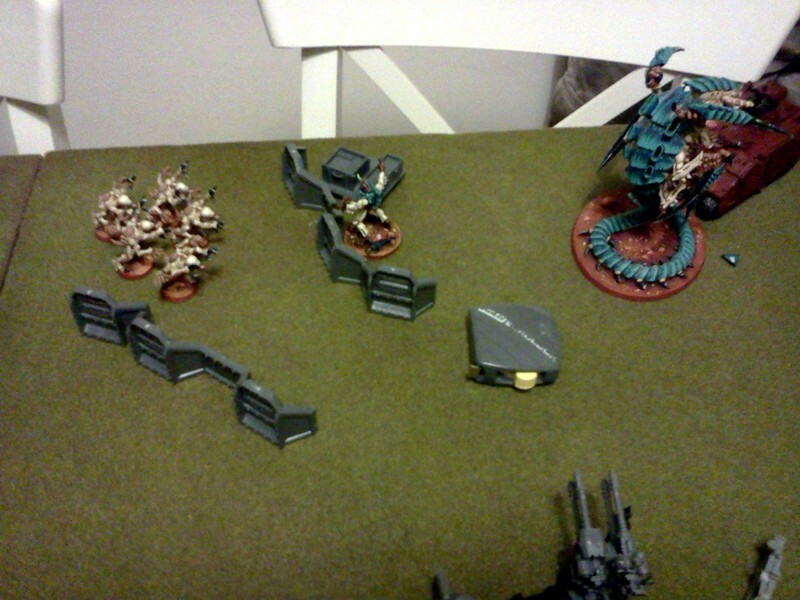 As you can see it was Vanguard strike deployment with the Emperor's Will 'Eternal War' Mission - my hive node objective behind the Tervigon and PeteB's ammo cache next to his Rhino behind the Aegis Defence Line. 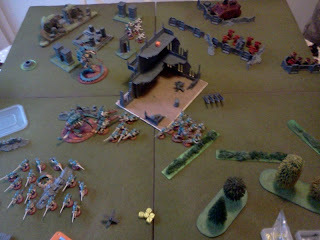 PeteB got first turn, did some shooting, took out four Devgaunts and a Hormagaunt and may have put a wound on the Prime. 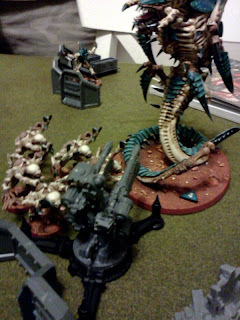 The Hive Guard targetted the only things in range - the assault marines and killed 2. 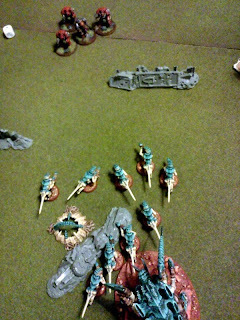 My infiltrated stealers, who'd lost two to first turn fire leapt from the ruins intent on mayhem. 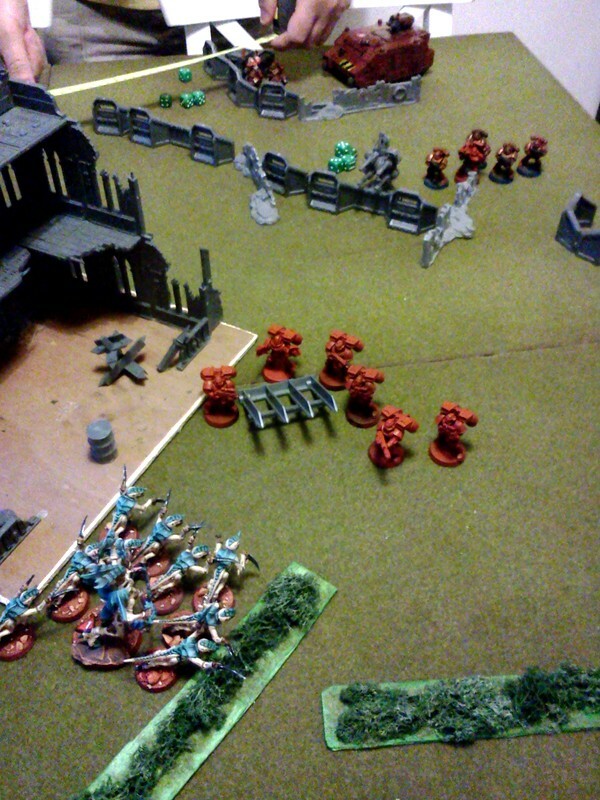 The main horde surged forwards, the Tervigon spawned 15 and pooped out with three 5's. 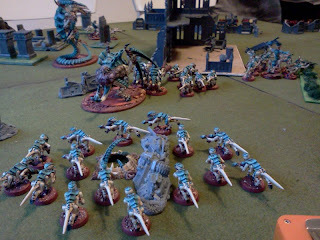 The Termagants surrounded my objective. 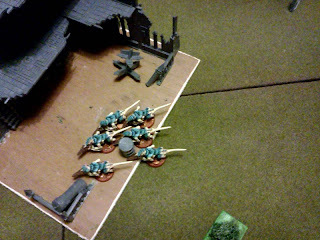 The marines hunkered down behind their defences, firing at anything that moved. 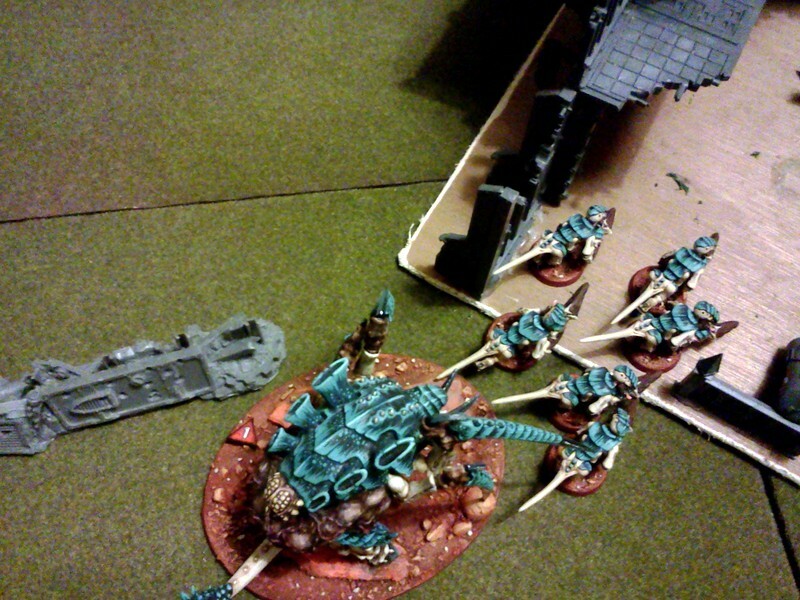 The Stormfinch burst onto the battlefield in a roar, blasting away at the Tervigon, taking a wound. 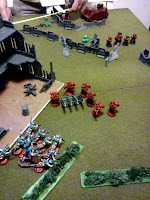 The Terminators teleported onto the battlefield but Servitor XXIV misjudged their co-ordinates and for fear they would materialise inside a cliff face emergency aborted the teleport and returned them to their strike cruiser. 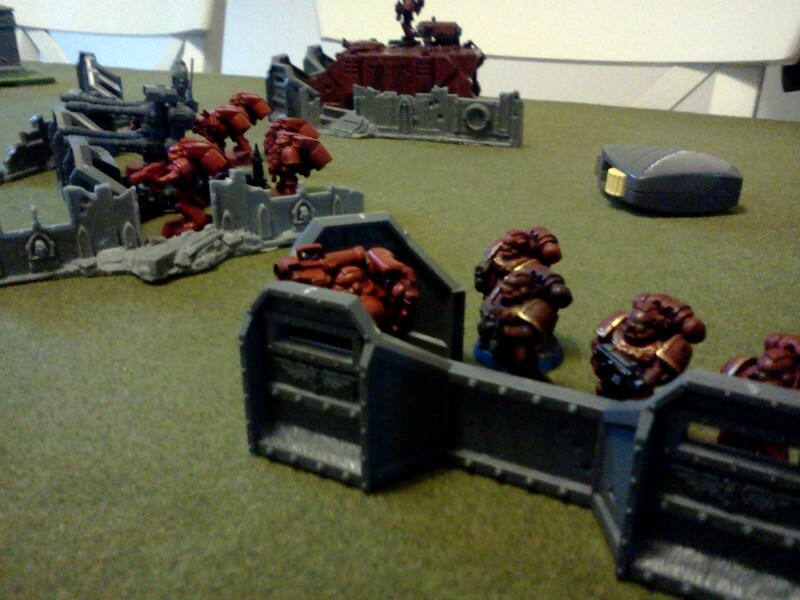 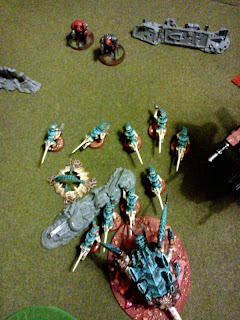 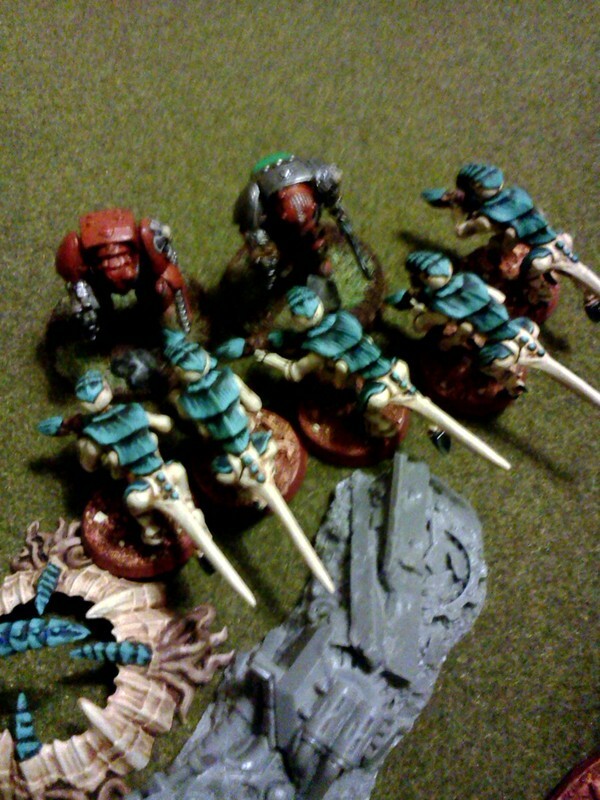 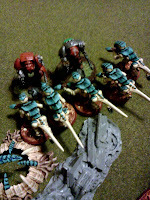 Meanwhile the assault marines took to the skies on their jump packs and fired into the oncoming brood of Hormagaunts. The Razorback reveresed, it's tactical squad disembarking to take up position next to the objective. 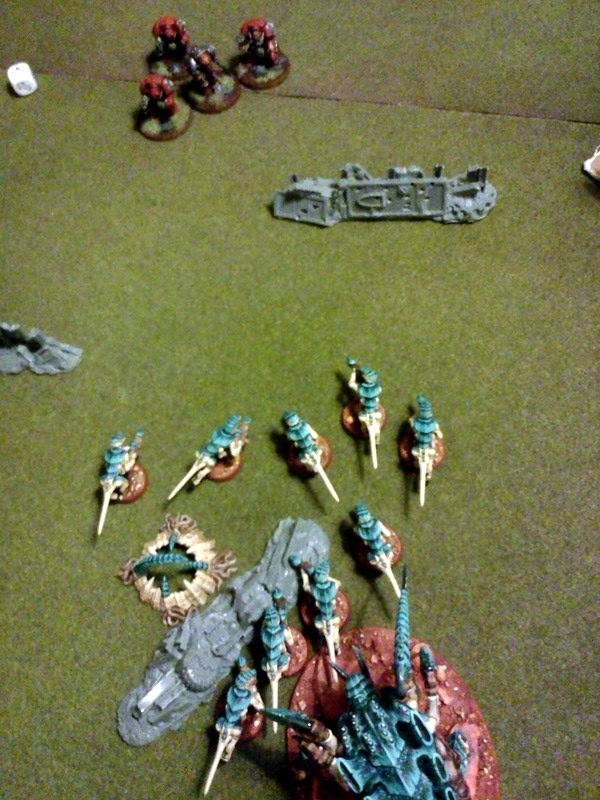 Most of the fire was directed at the Genestealers killing all and leaving the Broodlord with 2 wounds. The Hormagaunts and Prime charged down the Assault Marines but the gaunts couldn't survive the withering overwatch fire. 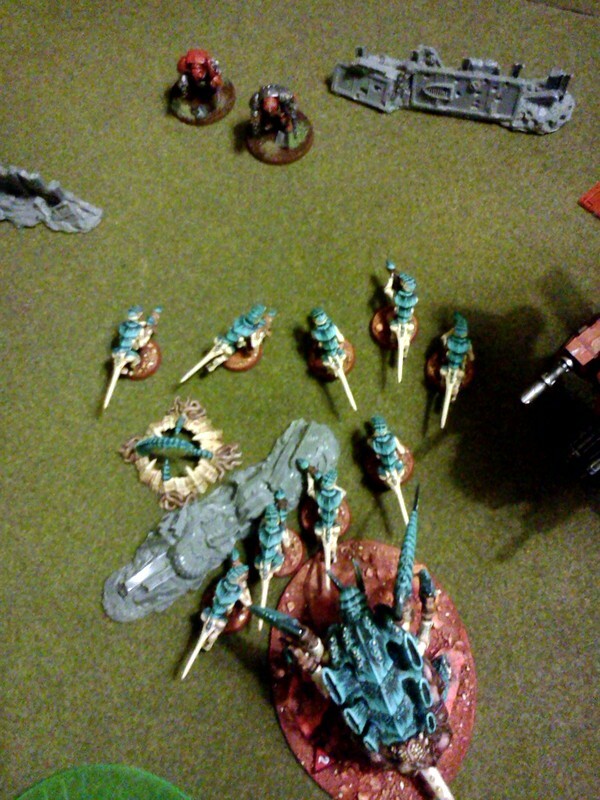 The Prime was eager to avange their demise through rending claws and Bonewswords but forgot how to use them and failed to wound a single marine. 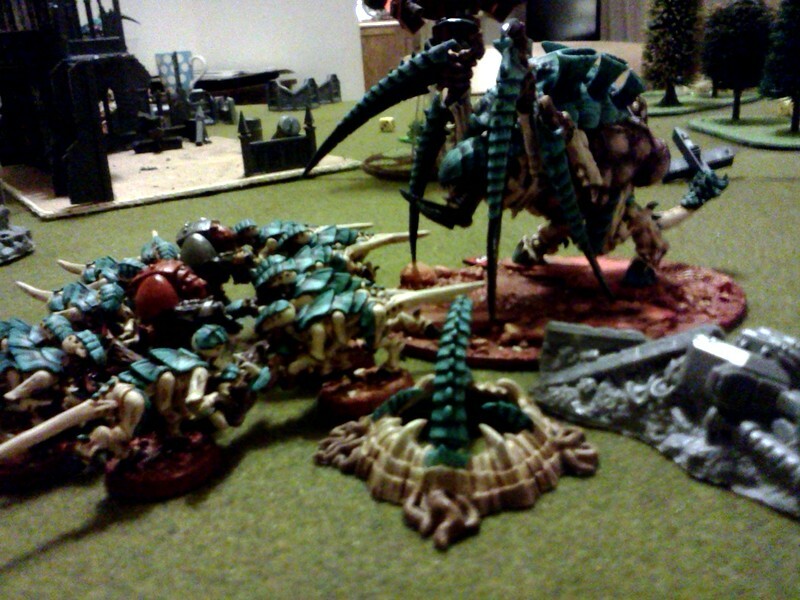 The Broodlord channeled the power of the warp, adding 2 attacks to his 5 on the charge, his +1 adrenal strength taking out the sergeant and perhaps 1 other marine [but his rending claws failed to bite], not before he suffered another overwatch wound. The Devgaunts scuttled thought the ruined Administratum building. 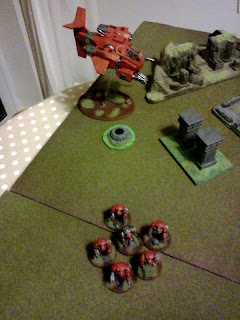 The Hive Guard were picked off by the hovering Stormfinch, not before they'd both managed to shoot it while flying but failing to penetrate or glance it's armour. 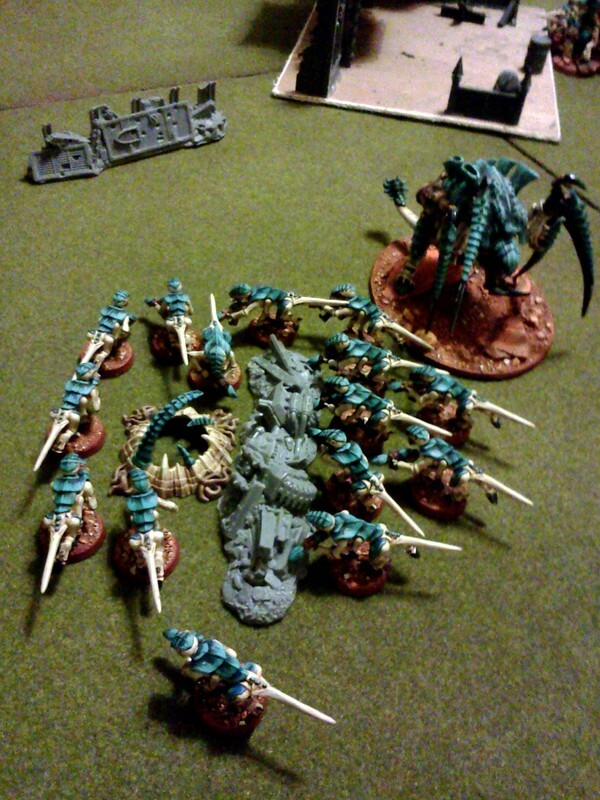 The Devgaunts charged to help the Tyranid Prime in combat, their combined weight too much but for a single marine. The Trygon had been busy slithering forwards to support the Broodlord [who'd managed to kill another marine, not throigh rending and with 3 attacks from Warp Speed], suffering wounds on the way but bashing down the defence line as it went. 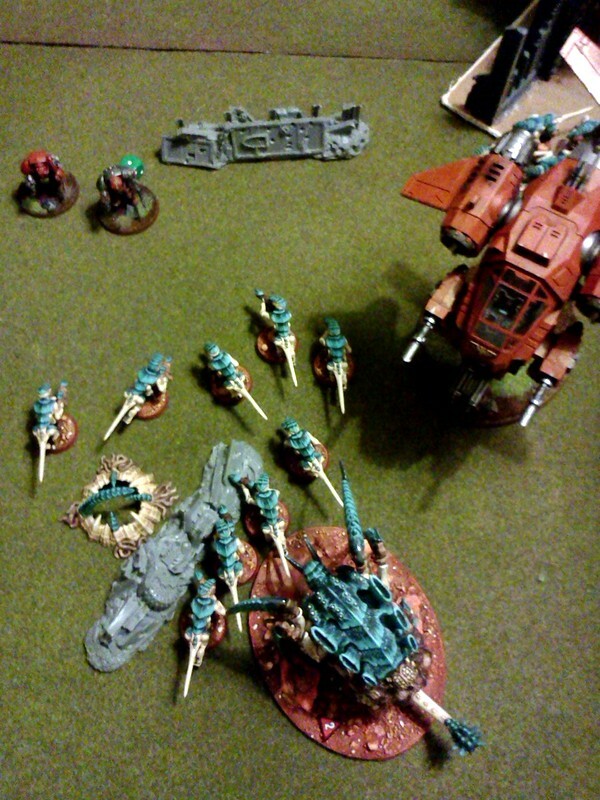 The Stormfinch had hovered to score wounds on the Trygon and having spent a turn chastising Servitor XXIV the Terminator squad appeared in blinding light and sharp crack. 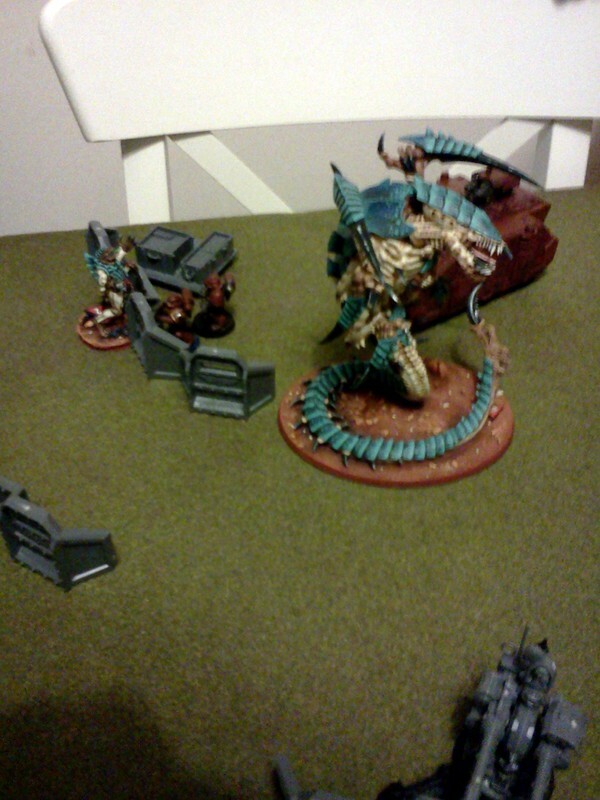 The Tervigon moved back to add support to the termagants on the objective. 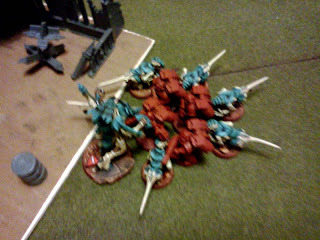 Storm Bolter and Assault Cannon fire did serious damage to the Termagant numbers but the Tervigon's cluster spines hit, wounded and killed 2 of the terminators in return. 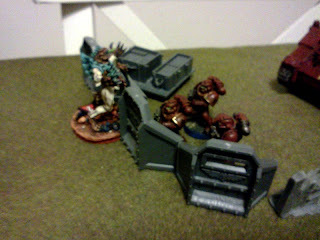 The last of the Assault marines was killed but not before the power fist wielding sergeant hammered the Prime into the dirt. The Devgaunts scuttled off to try and take on the Terminators. four Smash attacks tearing it apart and suffering two massive explosions that failed to wound the towering beast. More firing from the Devgaunts, Termagants and Tervigon managed to kill two more Terminators but the repositioned Stormfinch was desperate to gun down the remaining gribblies. 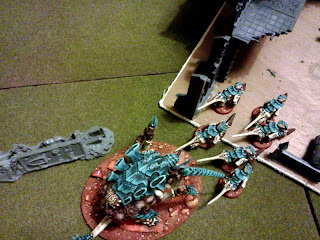 To finally silence the destructive Quad Gun the tervigon tore it to pieces like confetti. A wound was put on the Librarian, who promptly charged along with the remaining terminator into the brood. The Devgaunts and Tervigon joined the fray, the Tervigon graciously accepting the challenge of the Librarian but resulting in stalemate. 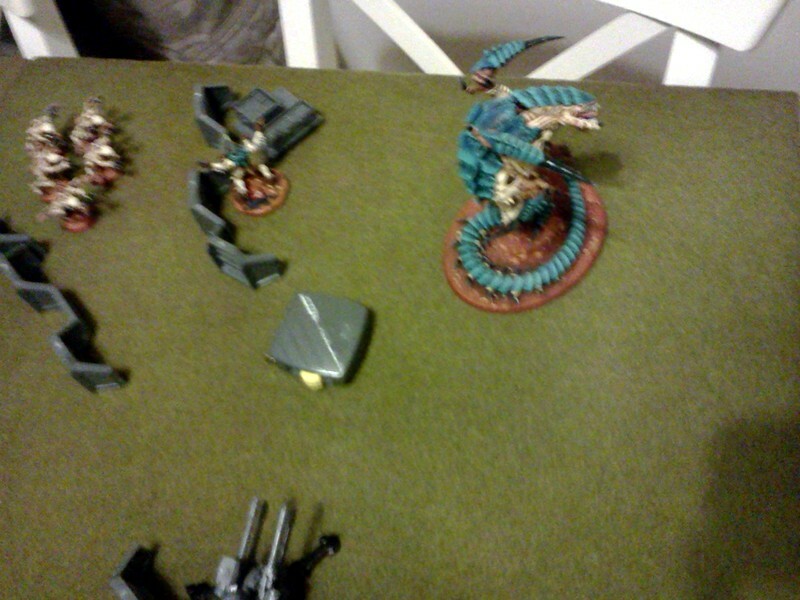 The Ymgarls and Trygon high tailed it back to the fight but couldn't reach the battle before the end of the game. We rolled one xtra turn of combat where the Tervigon squished the Librarian but the terminator remained. 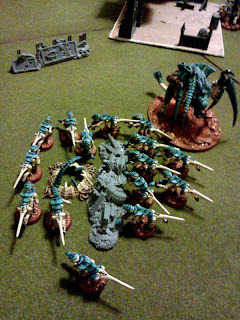 End result was a win for me. 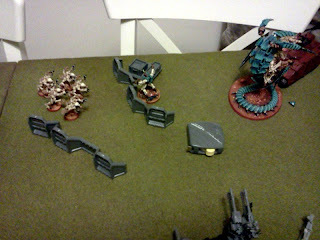 PeteB got shodachi [first blood] and was in my delpoyment zone and killed my Warlord [3kp]. 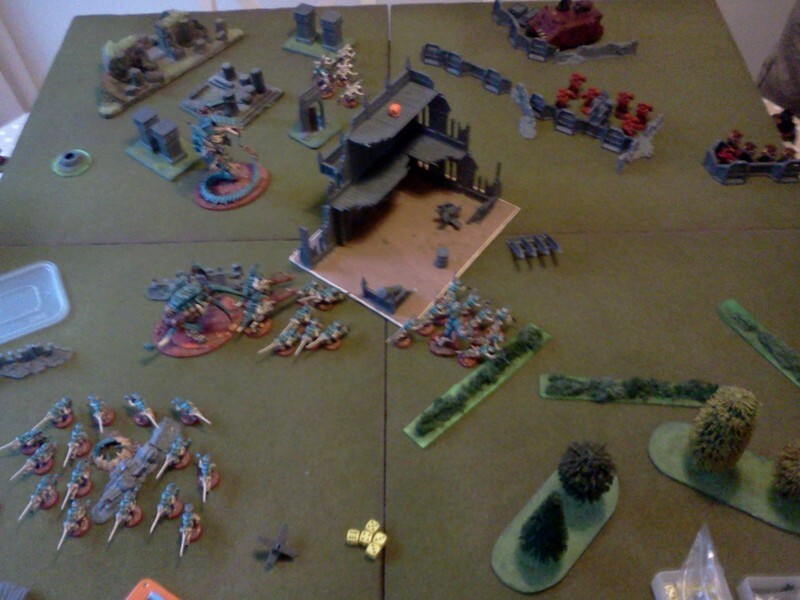 He contested my objective but I had his, and was in his deployment zone [4kp]. So I won, narrowly. 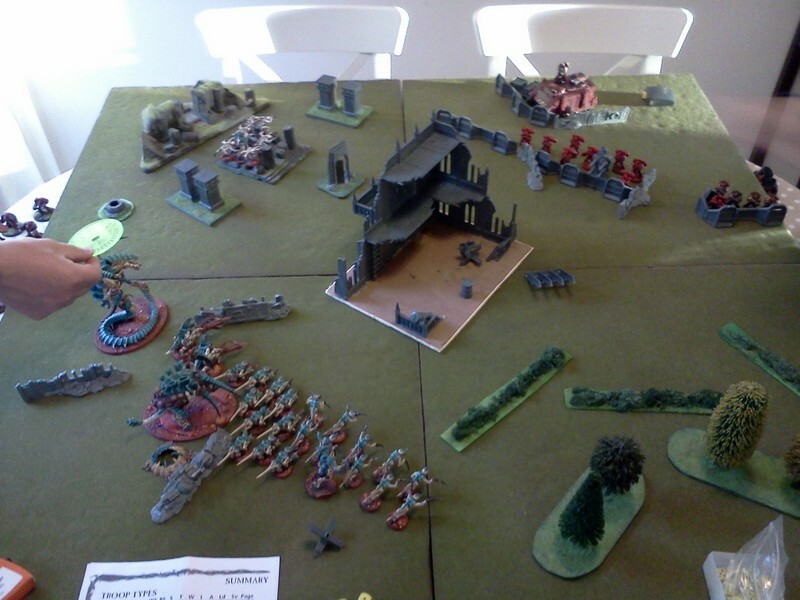 Still an awful lot to learn, so many 'modifiers' and I've still got to remember existing ones like instinctive behaviour - the Trygon was out of Synapse a few times and I forgot to roll. 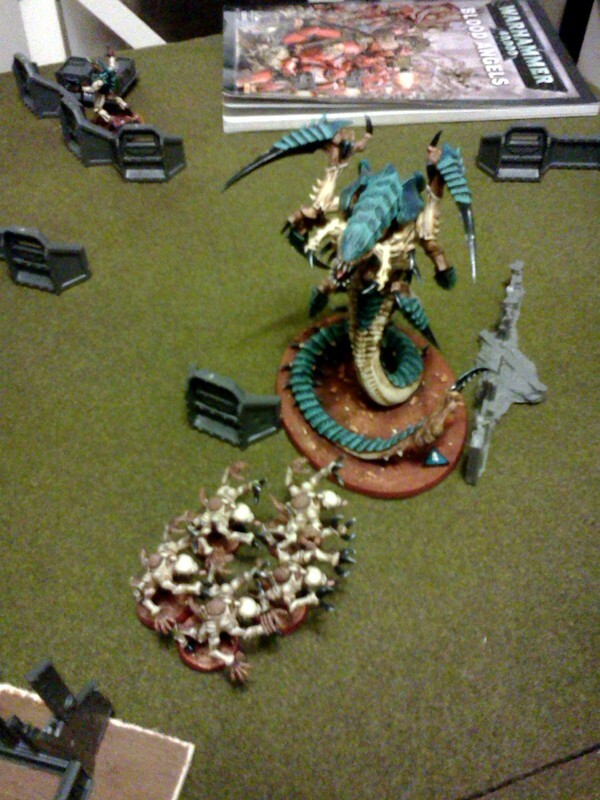 Not too much of a big thing but when rage gives you +2 on the attacks its worth remembering. 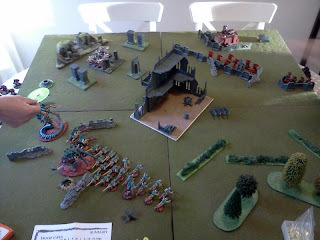 very nice report and congrats on the win. 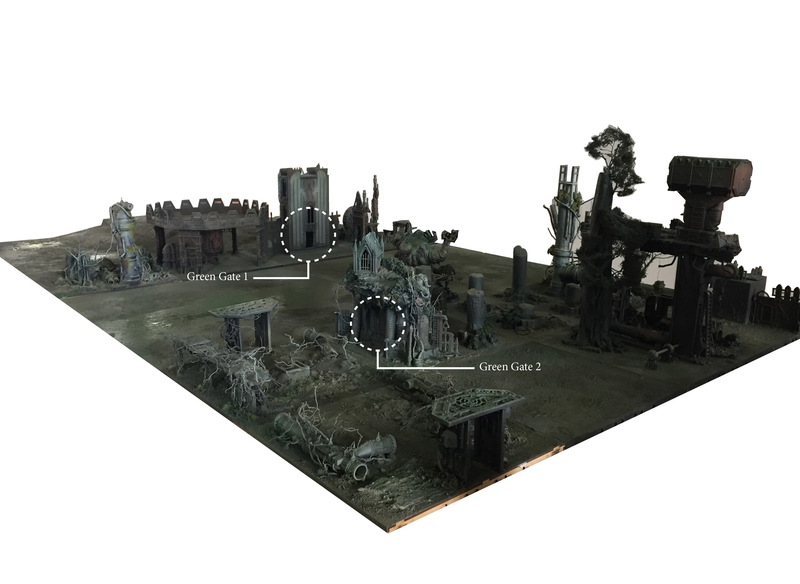 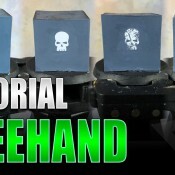 Terrain is everything - "Space Zombie Barricade"